I remember as a kid, I love playing with printed maze puzzles. Back then, such mazes were simple, just made up with lines. This book by Hiro Kamigaki, the illustrator and IC4DESIGN made me remember how fun it was again to go through the maze. 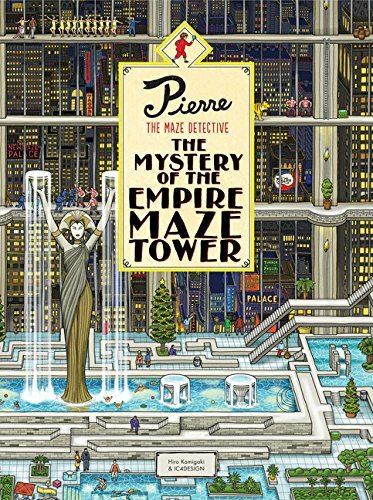 Pierre The Maze Detective is a large 36-page hardcover book filled with beautiful and intricate double-page size illustrations. Each illustration is actually a maze and you have to find your way from start to finish. As if it's not fun enough, there are also hidden items for you to look for. So it's like a maze and Where's Wally-kind of book. The story is about detective Pierre moving to New Maze City to visit the humongous New Maze Tower where there are multiple theme floors or areas in it. Then there's Mr X, the Phantom Thief, who's planning to steal something precious from the owner of New Maze Tower. That's the general premise that let's the reader travel through the different floors, and navigate up to the tower to catch Mr X red-handed. There are a few things I like about the book. It's incredibly fun. It's kinda challenging too because you have to find your way through the elaborate illustrated maze. The art is beautiful and imaginative. You get to see how each part of the building is designed and all the interesting and funny activity that happens within. The book's actually marketed to kids. I borrowed this from my sponsor to check it out. I'm very sure kids will love it. It's a fantastic book that will keep kids occupied for hours. This book is actually part of a series. There are other books and even a jigsaw puzzle.